The Second Annual Health Innovation Day will continue the theme from the 2018 forum to provide a venue where industry, government, academia, insurers, providers and others can discuss, share, and provide innovative updates and changes on innovative technology, tools, products and services in the health field. Included in this forum will be relevant presentations from two umbrella topic areas, that of Emerging Technology in Health and Public Health efforts. In addition, the forum will include select "mini" presentations on initiatives in health that are outside of the umbrella topic areas that will include shark tank breakout sessions and a poster session that will be voted on during the end reception. Join this forum to hear more about what is happening in the private, public, and academia area on health innovation. Presentation will provide an update of VA's future technology changes, innovative initiatives, and strategies to improve patient service, operations, and outcomes. The panel discussion will focus on industry's new, interesting, and innovative initiatives proposed for the future; coordination efforts between government and industry; major impediments to improving healthcare, and the "democratization of data". Alternate Payment Model Panel - what other payment modules other than "fee-for-service" is viable? Precision Medicine Panel - How is precision medicine a different treatment modality and why is it more of a valuable too? Telemedicine Presentation -How has telemedicine changed healthcare treatment within VA and how is it being used? Mobile On Demand Prescription Presentation - How has this new mobile platform that is connected directly with pharmacies improved service to patients and is it cost-effective and secure? The panel discussion will focus on a definition from government as to what does innovative healthcare mean; Examples or case studies that have improved operations, reduced cost, and improved service, new emerging technology, tools, or products and how they use them to measure successful outcomes; and barriers to adopting new technology. 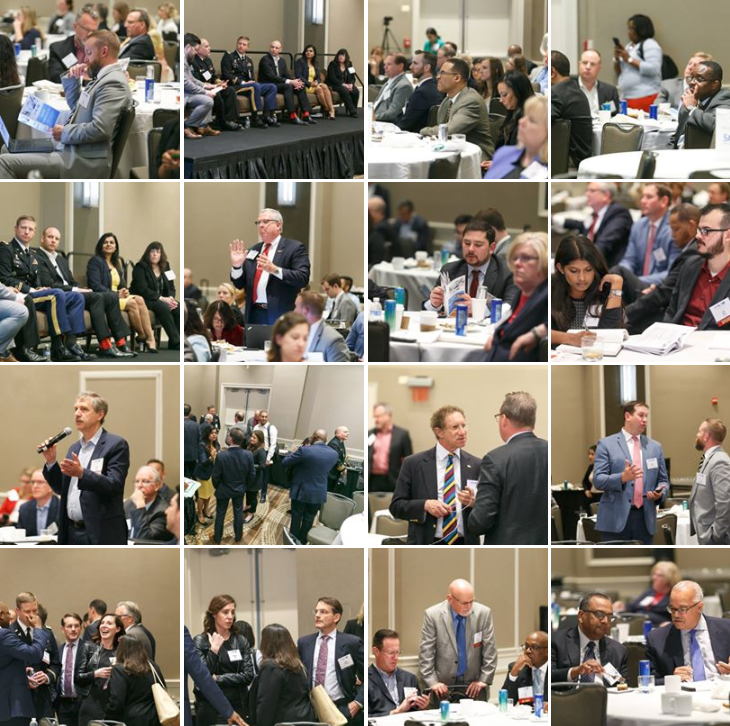 Individual presentations and discussions on opioid and chronic pain crisis/overdose progress to date and new technologies; Electronic case reporting to Public Health Agencies, health threats and how they are tracked, analyzed and monitored, and use of data sets and analytics in characterizing populations. To view videos of presentations, please click here! To view all the event photos, please click here! The event is organized by the American Council for Technology-Industry Advisory Council (ACT-IAC). ACT-IAC is a non-profit, public-private partnership dedicated to improving government through the application of information technology. ACT-IAC provides an objective, ethical, and trusted forum where government and industry communicate, collaborate, and learn. Where will the 2019 Health Innovation Day Take Place? Attendees will be eligible for 7 CLPs (Continuous Learning Points). For more information please visit the Training Credit link on the event homepage. Registration cancellations made on or before March 27, 2019, will receive a full refund, minus a $75 processing fee. Registration fees are non-refundable starting March 28, 2019. No-shows will be charged the full registration fee. Substitutions are available at any time for no fee. Cancellation requests must be submitted in writing to Events@actiac.org. Requests for cancellations will not be accepted via telephone. The individuals who successfully complete this program are eligible to receive 7 Continuous Learning Points (CLPs).